Hi brociouz - i was skimming through this post and your puddle lights really caught my eye! Yup, those are the 4 SMT High Power LED flanks in my picture. 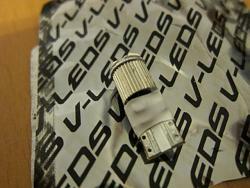 You could try shooting V-LEDs an email or give them a call and ask if they have a European distributor. I suspect they don't but it's worth a shot. Good luck! do u have any pics of ur parking lights? brociouz, how come you used the flank type for the puddle? Isn't it better to use the ones from the dome light since those points down when installed on the puddle light? The connector for the puddle lights comes in at an angle, it doesn't point down. So the LEDs on the flank are pointing straight down when installed. I just got the front dome bulbs in. Are you suppose to remove the white wrapping near the bottom of the bulb? White wrapping? You mean the white base connector? 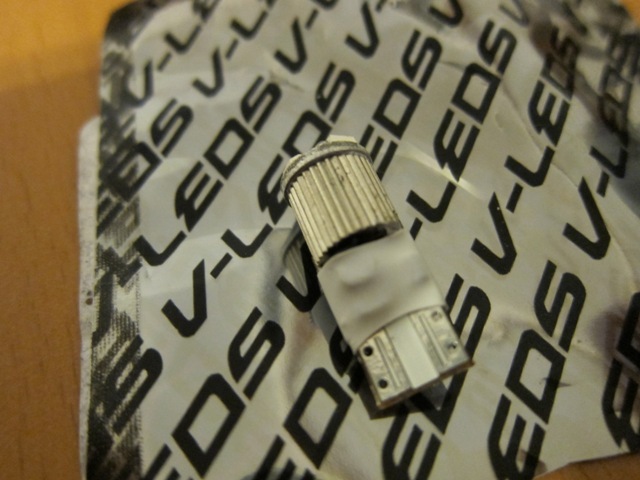 I don't remember any wrapping on my V-LEDs. This. I left it on for now and it still works. Didn't know if was I suppose to remove it or not. Oh that, yeah leave it. My puddle and door/courtesy lights are blue. My interior is 6000K - white with a hint of blue. No purple. how much does the whole set cost? It depends what you get. If you get everything including the 3 front domes, the 2 rear domes, the 2 door/courtesy lights, the 2 visor lights and the trunk, the subtotal is $120.93.